Mocha, online retailer of modern home accessories and gifts, has launched the Link Mugs – a set of three mugs that link together. 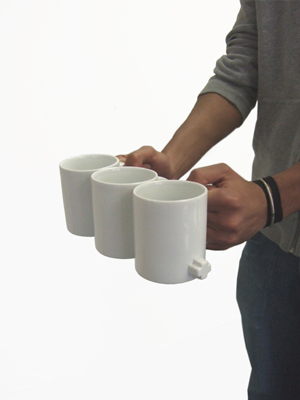 Link Mugs solve the problem of how to carry several mugs at once without the need for a tray. It’s a mistake many people can relate to: attempting to carry too many mugs in one go leading to spills, burnt fingers and stains on the carpet. So, inspired by the quintessential builder’s mug, British designer Jonathan Aspinall has developed an original solution to this problem – mugs that can link together. Each cup has a plus shaped plug on one side and a corresponding receptacle on the other. Thereby allowing the mugs to be linked together and carried in a line with ease to friends, family and work colleagues. Manufactured in white ceramic, the Link Mugs combine modern design with functionality. Mocha, online retailer of modern home accessories and gifts, has launched the Ceramic Notepad. Resembling a spiral jotter, it is made entirely from clay. The Ceramic Notepad helps reduce the scraps of paper that can clutter a desk, saving paper and helping to create a more organised working environment. The wipe clean Ceramic Notebook is an indispensable desk accessory for making lists, jotting down phone numbers or leaving messages. A hole through the top resembling a spiral jotter keeps pen and pad together for convenient use. 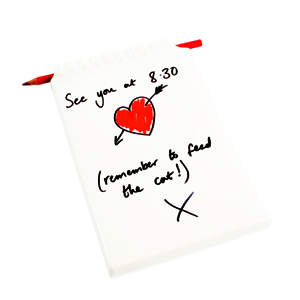 The pad comes complete with a china pencil, and can also be written on using dry-wipe markers. A dry or damp cloth will clean the ceramic surface and it is probably the first dishwasher safe notepad. The Ceramic Notepad can either be used on the desk or mounted on the wall.